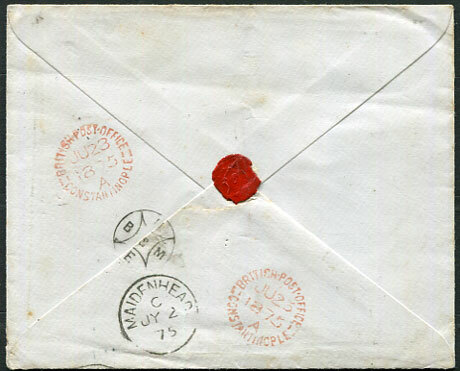 1874 wrapper by private ship "Picarche" to Marsiglia (Province of Genoa, Italy) with GB QV 4d pmk'd "A25" duplex dated OC 19 74 showing red MARSEILLE 23 OCT 74 transit, no backstamps. 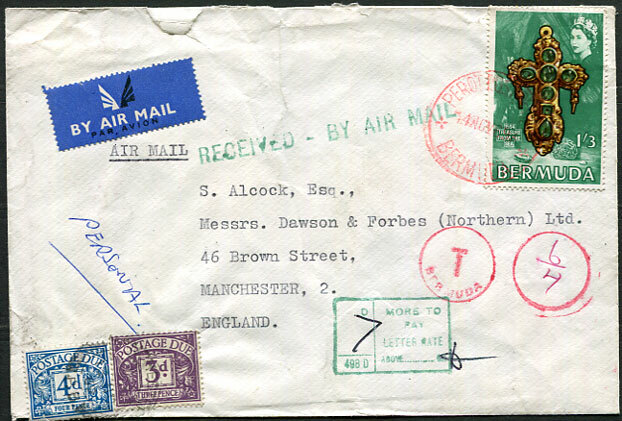 1065 (NO 14) underpaid cover with QE2 1/3d to Manchester with various tax handstamps and GB 3d, 4d Postage Dues added and cancelled. 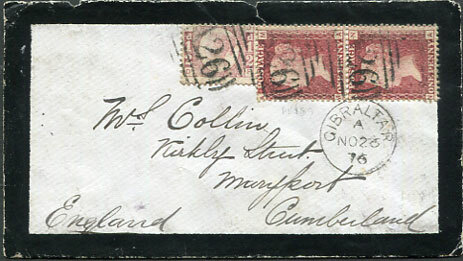 1876 mourning cover to Maryport, Cumberland with GB QV ½d, pair 1d tied "A26" with Gibraltar A/NO 26 76 despatch, part reverse flap clear of very fine Maryport C/DE 4 76 arrival. 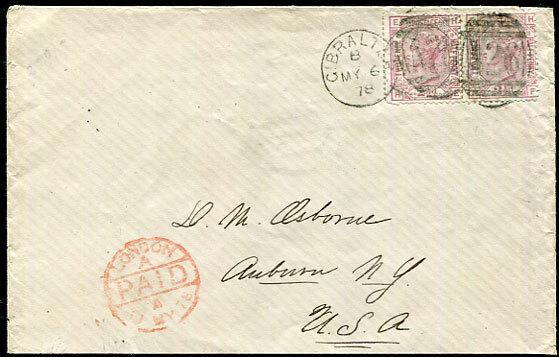 1878 double rate cover to Auburn, New York, USA with pair GB QV 2½d rosy-mauve Plate 10 tied "A26" duplex dated B/MY 6 78. 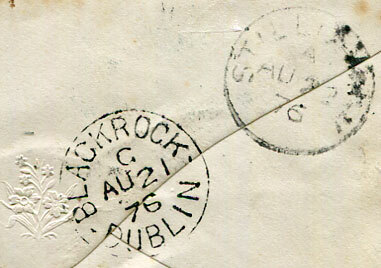 1877 cover with black "FORWARDED BY THE/AMERICAN AGENCY/GIBRALTAR/RENNY MASCARENHAS & Co/AGENTS" who added QB QV 2½d rosy-mauve Plate 7 pmk'd "A26" duplex dated A/AU 30 77 to Capt. E.D. 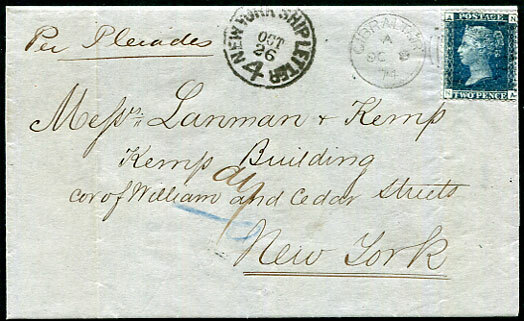 Lane, Yarmouth, Maine, USA, opened right edge severing perfs. 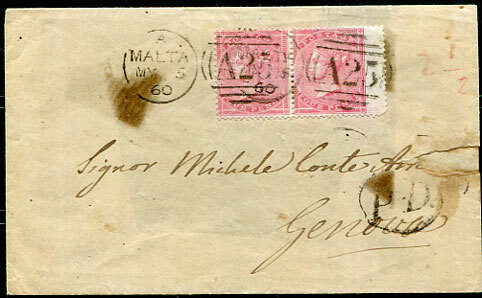 1880 mourning wrapper from Larios Hermanos to Genoa, Italy with GB QV 2½d Plate 17 tied "A26" duplex dated A/MY 5 08 (year error), backstamped top flap for display with Estafeta De Cambio, Madrid (MY 7) and Genova (10 5-80). 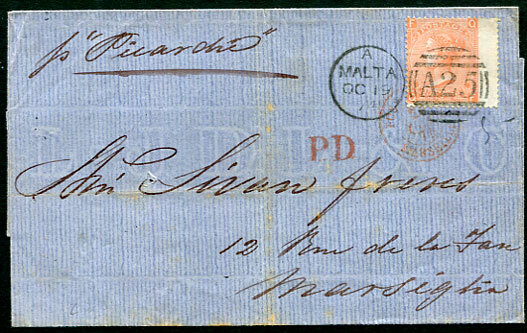 1880 mourning cover to Sir. 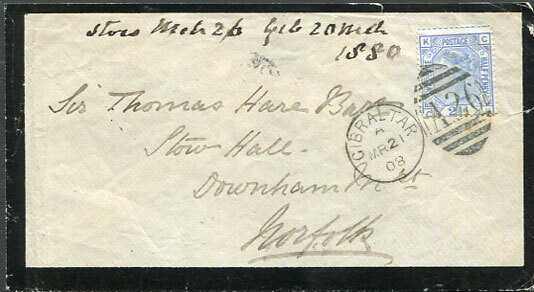 Thomas Hare, Stow Hall (2nd Baronet 1807-1880), Downham Market, Norfolk with GB QV 2½d blue Plate 17 tied Gibraltar duplex dated A/MR 21 08 (year error), backstamped superb Downham A/MR 26 60 cds, small faults. 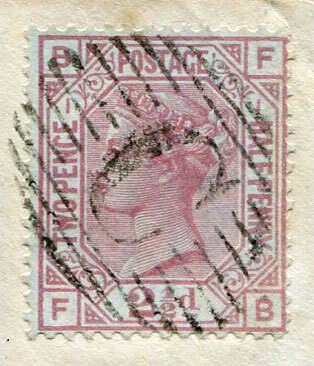 Early use of the "08" year error and early use GB QV 2½d blue Plate 17 as issued in Great Britain FE 5 1880. 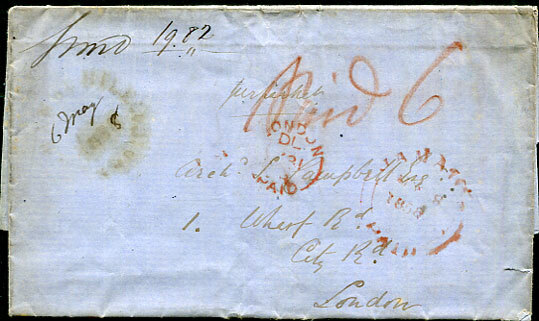 1875 cover with summer use "via Varna" to Maidenhead, Berkshire with GB QV 4d Plate 14 pmk'd "C" and signed "T. F. Hughes" lower left, reverse circled H.B.M.E.C handstamp and red Constantinople JU 23 1875/A datestamp (7 days prior change to 2½d rate with JY 1 1875 joining of the U.P.U.). Thomas Fiott Hughes (1825-87), Oriental Secretary at Constantinople from 1859 was regarded by Ambassador to Constantinople Sir Henry Elliott as "perfectly useless". 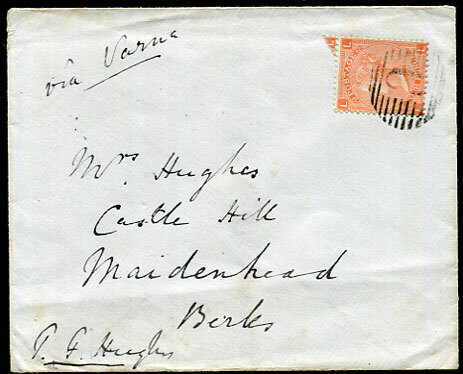 After Hughes' retirement in 1875 the post was abolished. 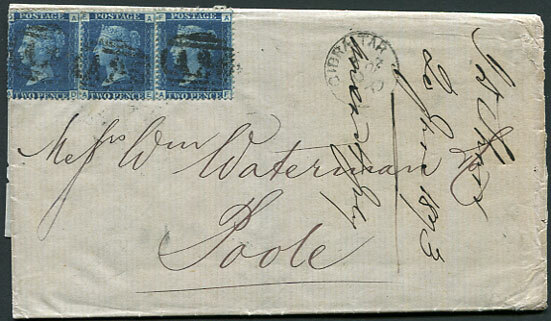 1861 wrapper to Ancona, Italy with GB QV 4d pmk'd "A25" duplex dated A/NO 8 61, transit and arrival backstamps can display. An unusual destination. 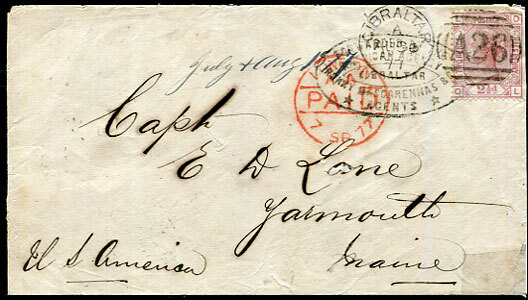 1860 entire to Genoa, Italy with GB QV 4d pmk'd "A25" duplex dated A/NO 3 60 showing sender's cachet and backstamped GENOVA 9 NOV 60 arrival. 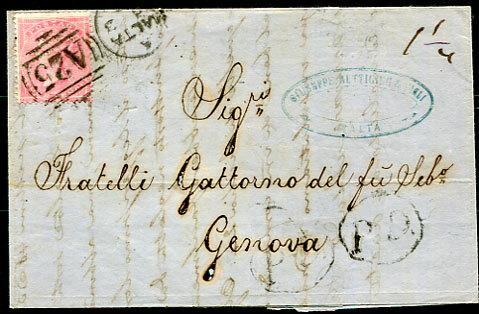 1860 to Genoa, Italy with pair GB QV 4d tied "A25" duplex dated A/MY 5 60, large part of reverse cut away with nasty hinge remains but the double rate uncommon. 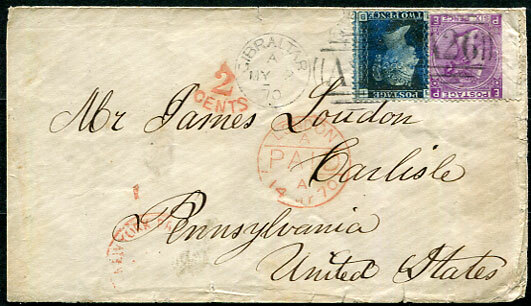 1870 cover to Carlisle, Pennsylvania with 2d, 6d pmk'd "A26" duplex dated A/MY 2 70, red London and New York Packet transits and handstruck "2 CENTS". The 2d a little oxidised. 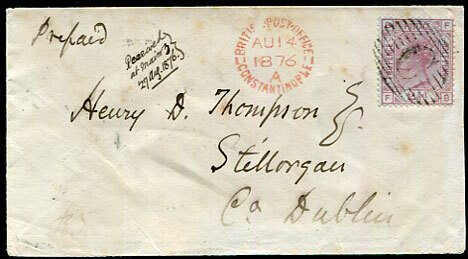 1875 cover to Stillorgan, Co. Dublin, Ireland with BLUED PAPER GB QV 2½d rosy mauve tied Constantinople "C" with red AU 14 1876/A despatch alongside, backstamped BLACKROCK and STILLORGAN arrivals with face manuscript appended "Received at Mainz (Germany) 27 Aug 1876". 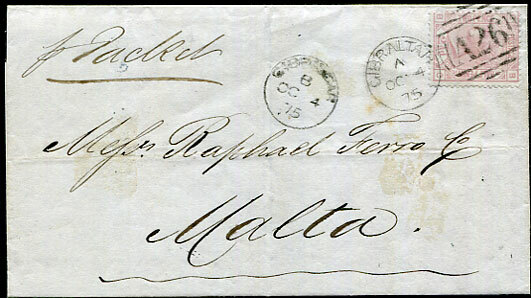 1875 mourning wrapper from Francis Booth & Co to Malta with BLUED PAPER GB QV 2½d rosy mauve tied "A26" A/OC 4 75 duplex with B/OC 4 75 cds alongside, very fine Malta A/OC 16 75 arrival backstamp which displays. 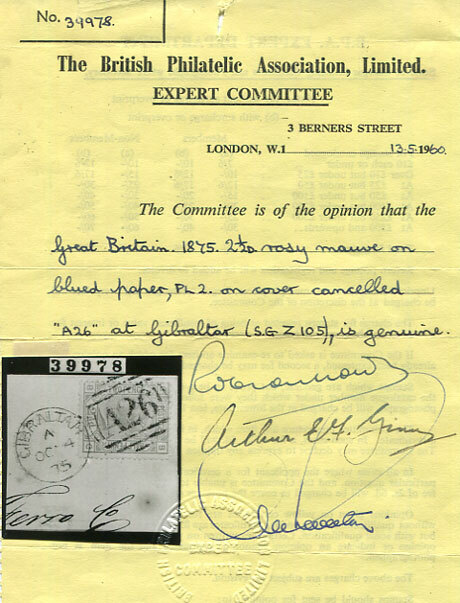 1960 BPA Certificate. 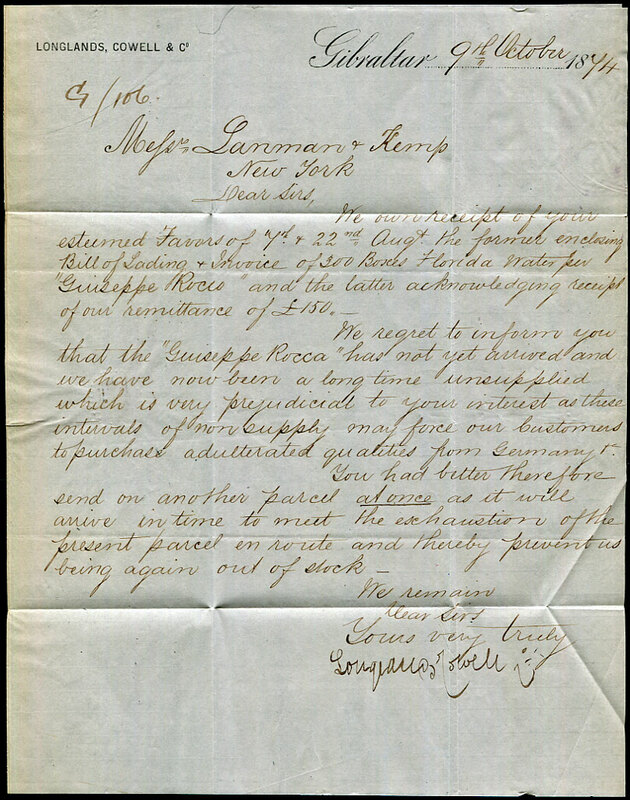 Ex John O. GRIFFITHS. 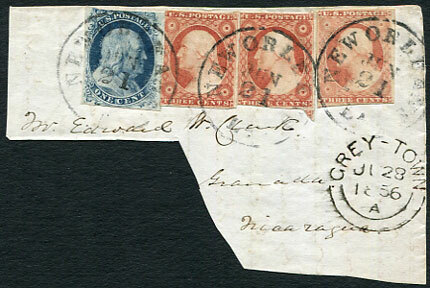 1856 piece addressed Edward Clark, Granada, Nicaragua with US 1c blue, 3c rose-red x 2, 3c dull red tied NEW YORK JUN 21 with GREY-TOWN JU 28 1856/A arrival dbl-arc. Only one other example of the GREY-TOWN double-arc dated MR 1 1856 recorded in the GB used abroad Parmenter/Gordon handbook (Page 4/49). 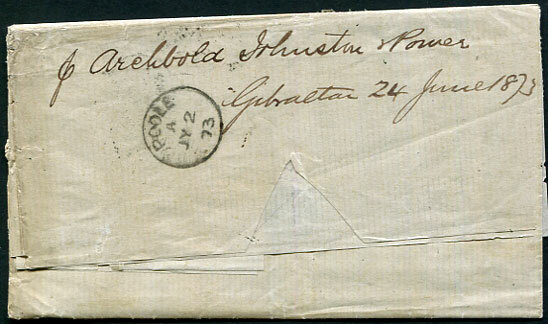 1873 entire headed "Cadiz 20th June 1873" to Poole, England with "p. Archbold Johnston & Power Gibraltar 24 June 1873" manuscript forwarding on reverse with GB QV 2d strip of three affixed and pmk'd "A26" with GIBRALTAR A/JU 24 73. 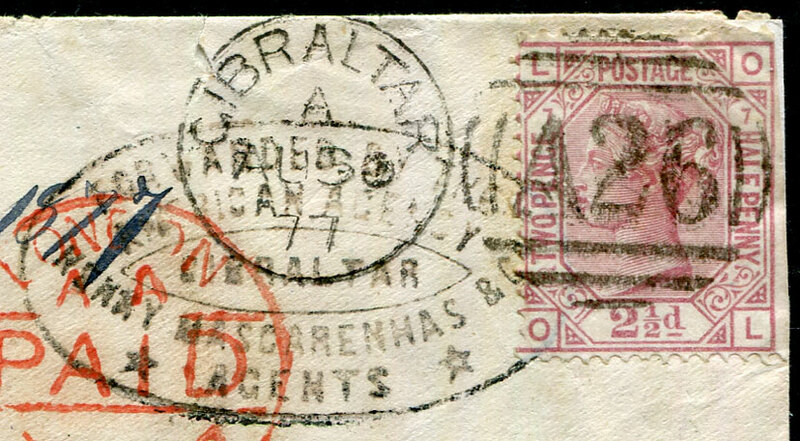 No Spanish charge as sent in another cover to Gibraltar from Cadiz. Very rare as such, Ex MOELLER. 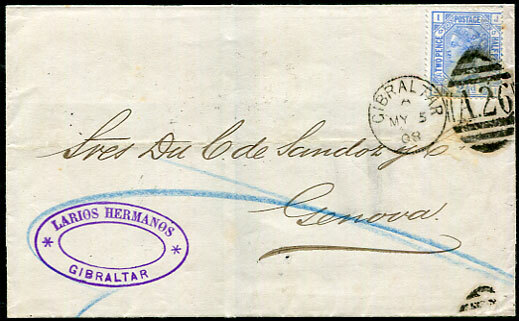 The Carlist Civil War caused intermittent interruptions to the overland route to the UK, and the maritime route from Gibraltar became a more reliable alternative but required the use of a Forwarding Agent in Gibraltar. 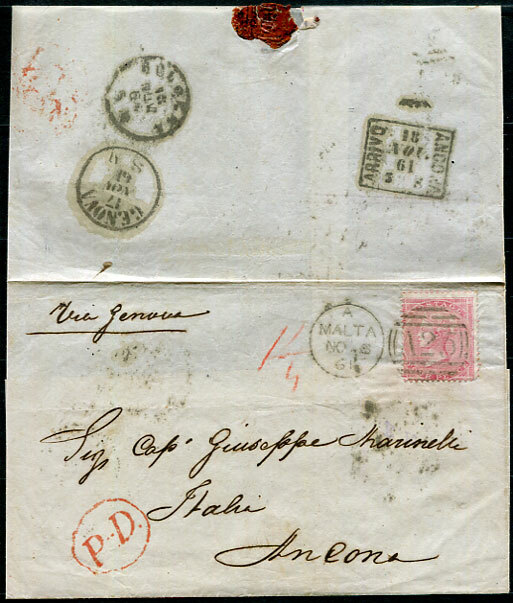 (Of the Gibraltar/Spain adhesive combination covers currently seen 15 are ingoing to Cadiz, and only 4 are outgoing, all to Malta). 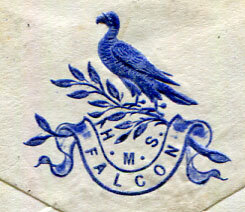 1880 H.M.S. 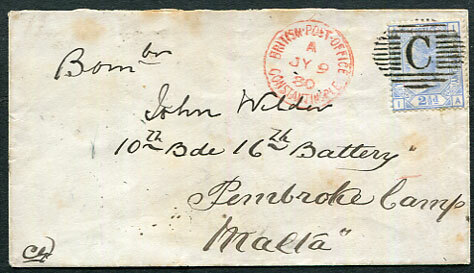 Falcon flap cover to Bombardier John Wilder, 10th Brigade, 16th Battery, Pembroke Camp, Malta with GB QV 2½d blue Plate 19 pmk'd "C" with red A/JY 9 80 despatch alongside, some toning.